Another non-conference game, another blowout as the Huskies clobbered Portland State of the Big Sky Conference 41-3. Finally, Washington draws Arizona, a team that can fight back. Pageantry and ceremony ruled the day. The band was loud, smoke bombs spewed, and the Huskies went through all the rituals associated with a ceremonial weekend at Husky Stadium. The other element that was ceremonial? The game. The No. 8 Huskies, to the surprise of no one, dominated Portland State of the FCS Big Sky Conference 41-3 to cap a non-conference schedule with the toughness of pre-chewed tapioca. Pop quiz: Portland State’s mascot is: A) The Pilot B) The Pioneer or C) The Viking. If you picked C, congratulations. If you had to look it up, you’ve shown what was wrong with Washington’s non-conference schedule. Saturday marked the final chapter in a 148-20 collective beat-down of Rutgers, Idaho and the Vikings. The band paid homage to Rocky at halftime. It was a fitting tribute to Washington’s decision to schedule the equivalent of frozen slabs of meat upon which to harden fists before starting Pac-12 Conference play. Head coach Chris Petersen managed to suggest there was room for improvement. While worrying trends might need to be corrected in secrecy, there was little for Petersen to worry about Saturday. The game was over by halftime. Washington took the opening drive 75 yards in five plays, capped by a 43-yard catch-and-run touchdown by WR Chico McClatcher. Seconds later, Portland State bobbled a high kickoff, allowing RB Lavon Coleman to jump on the ball. UW started the drive at the Vikings 26-yard line. Three plays were needed to get QB Jake Browning to flip a pass to TE Darrell Daniels to double the score. At the start of the second quarter, Browning hit McClatcher on a fade down the near sideline for a 14-yard score to put UW up 21-0. On Portland State’s next drive, QB Alex Kuresa threw a pass that was swatted backward by LB Tevis Bartlett, who chased the loose ball and recovered it at Portland State’s 4-yard line. RB Miles Gaskin walked into the end zone to crank up the blowout. Just before half, Kuresa picked out TE Maximo Espitia 30 yards downfield after DB Ezekiel Turner lost his footing. As Espitia rumbled toward the end zone, Turner caught up to his man and slammed him from behind, jarring the ball loose. Pursuing LB Keishawn Bierria fell on it to keep the Vikings scoreless. Portland State got on the board with a minute to go in the third quarter. After a pair of tackles for a loss by DL Greg Gaines inside the 10-yard line, PK Jonathan Gonzalez managed a 26-yard field goal. Washington’s defensive dominance was obvious with four turnovers — hree fumbles and a pick in the end zone by DB Sidney Jones. The Huskies recorded 11 tackles behind the line of scrimmage for a cumulative loss of 39 yards, including four sacks. Gaines led the defense with seven tackles, three solo. Portland State had 34 net yards rushing, despite running the ball on 42 of 59 plays to average 0.8 yards per carry. A four-yard touchdown pass to Gaskin early in the fourth quarter was the final action for Browning, who finished 12-of-19 for 163 yards and four touchdowns. Backup QB K.J. Carta-Samuels added a final touchdown to TE Will Dissly. Besides the two TDs, McClatcher had 69 receiving yards and added 37 more on the ground. 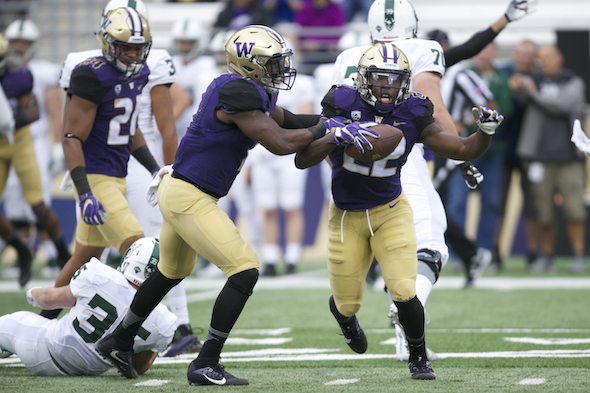 Despite the expected dominance, the Huskies had two problem areas: Punts and penalties. Washington had only three punts, but twice P Tristan Vizcaino saw pressure break through and nearly block his kicks. Of bigger concern were the flags. Five cost 65 yards, including a holding penalty by OL Matt James that robbed the Huskies a first down. Saturday was anything but close. That probably won’t be the case when they travel to face Arizona Sept. 24 (7:30 p.m., Pac-12 Networks). Petersen sounded equal parts excited and anxious to match his team against a team that could actually fight back. Washington will go full of adrenaline. It took three games to raise the curtain, but now rehearsal is over.